Six Times More Explosive Than 'Making A Murderer'! In his latest thrilling true crime book, bestselling and award-winning author John Ferak explores the murder, investigation, trial, conviction and eventual exoneration--the largest such ever in the United States--of the Beatrice 6. 5つ星のうち5.0Unbelievable that this could happen... Must read! This book was exceptionally written! It gave detailed info about the people who were involved, the facts of the crime and the way it all came about. people could be manipulated into believing they were at a crime they knew nothing about, by the authorities, by using head games. Especially a crime this horrendous. I was appalled with the authorities involvement, it was so clear these people knew nothing about the crime. They ruined six lives for their own gratification! And even more upseting is that the authorities that felt this was wrong... Just walked away without even trying to help them or find the truth. If I hadn't know this was a true story, I'd have said the book wasn't even a believable plot. But, they do say truth is sometimes stranger then fiction... This book is proof. I'm adding this because when I wrote this revue I was so ao over whemled! These stories need to be told! We need to be aware of the possibility of becoming a victum... It does happen... It needs to be stopped... The only way is through knowing and not being niave ..l thank you for bring this to our attention! True crime is a genre with a lot of sub-categories. There’s serial killers, non-murder crime books, mob/gang crime, cold cases, and most recently miscarriages of justice. John Ferak’s book Failure of Justice falls into that latter category. It is almost like a twisted season of Fargo (which is a compliment). A woman is brutally raped and murdered in a small Nebraska town (Beatrice). The crime goes unsolved for four years. Then deputy of questionable reputation (a failed pig farmer) picks up the case. Through deception and coercion, one suspect after another is forced to turn against others, confession and implicating the others. Only one of these alleged perpetrators digs his heels in and claims his innocence. It is a spiderweb of unfounded accusations and confessions that have nothing to do with the physical evidence. Soon the “Beatrice Six” are convicted on their own mutual words and sent off the prison. And that’s just the start of the story! What Ferak does is untangle this complicated plot, one spiderweb strand at a time. What the reader comes to see is that these people, in some cases virtual strangers, have been manipulated by the legal system. It is raw and unfair – and downright scary. This could happen to anyone. When you watch HBO’s outstanding “The Night Of…” it is a mirror of what the Beatrice Six went through. 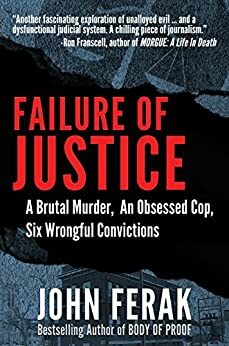 John Ferak kept me in-line as a reader as he unravels this story – no small task given the complexities of the case and the number of characters involved. Outstanding work here. He takes us through the eventual release of these perpetrators and the pursuit of the real killer. This is a story of horrific miscarriages (multiple) of justice – of small towns, bitterness, nepotism, and the gritty underbelly of almost every community. I was riveted through the entire book and the level of detail provided is outstanding. The only thing I can compare this too is Mardi Link’s Wicked Takes the Witness Stand, a similar story in the same sub-genre of true crime. Failure of Justice should be required reading in law schools as a lesson in what not to do. In a time were, wrongful convictions and calls for Criminal justice reform are getting plenty of attention. John Ferak delivers a book that is a compelling study on The Beatrice six case. 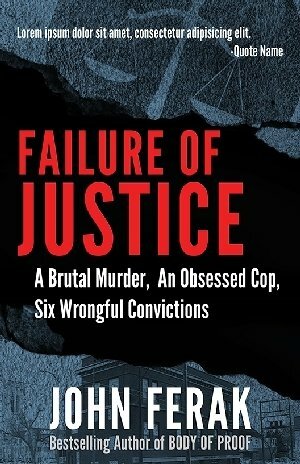 I highly recommend this heartbreaking look at when Law enforcement fails not only the accused but the victims Family as well. Every bit as compelling as Making a Murderer wich coincidentally it parallels in many ways,with one huge difference. This is a story that more people should be made aware of. Most people are of the belief that no one would ever confess to a crime they did not commit. Hundreds, maybe thousands, of innocent people have served time or are currently serving time as a result of false confessions. Author John Ferak points out that in cases of DNA-backed exonerations, about 25% involve false confessions. So how does a false confession happen? In most cases, there is a lengthy interrogation without a lawyer present. The individual is poorly educated. Investigators threaten the individual with lengthy prison time if they don't confess. When that person finally breaks under pressure, they give elaborate, detailed accounts of the crime. When their version of the crime doesn't fit the evidence, the interrogator coaches them and provides them with crucial details. But even when the entire interrogation is videotaped. Even when it is obvious that a confession is false. The police, prosecutors, and defense lawyers all go along as if the inconsistencies in the confession can all be ironed out later at trial. If you watched the documentary "Making a Murderer," then you saw Brendan Dassey's false confession. Unfortunately, Brendan is still in prison. Other famous cases involving false confessions include the Memphis Three, The Central Park Five, and the Norfolk Four. The story of the Beatrice Six, which involved four false confessions, is a compelling case study of our flawed justice system. It shows why we should abolish capital punishment. It shows why we need to hold prosecutors accountable when their actions directly contribute to a wrongful conviction. Maybe if their livelihood was at stake, they wouldn't be so willing to ignore evidence pointing away from the accused. They wouldn't be involved in destroying or suppressing evidence of innocence.